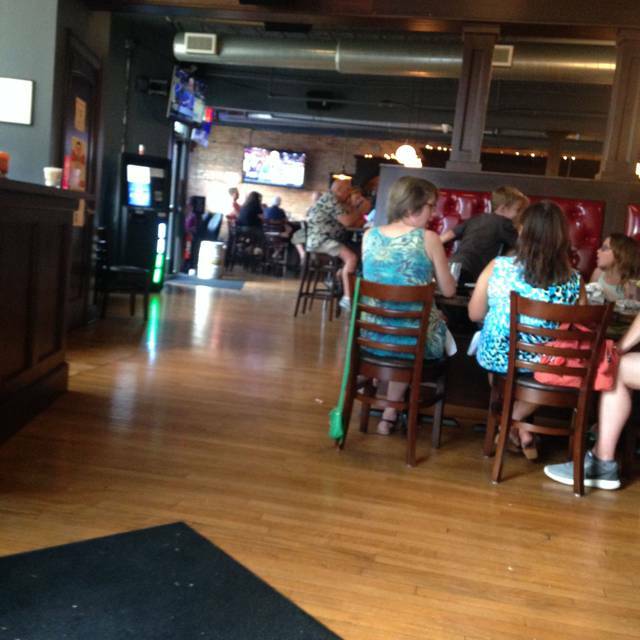 Lavergne’s Tavern opened in June, 2016 at the corner of Windsor and East Avenues in the old Garv’s Inn location, a staple in Berwyn since the ’60s. The tin ceiling and hardwood floors are restored, and the storied Garv’s Inn bar is rebuilt from scratch using reclaimed black walnut. A combination of high-top bar seating and lower tables help keep the atmosphere friendly to both families and those looking to join a date or friends for a night out. The brunch menu had a good variety of choices. The mango Bellini was perfect. It was very busy and loud, but staff was attentive. The table was missing salt and pepper, but helped ourselves. My niece loved her entree. Remarked about the roasted vegetables and how she was looking forward to having it for dinner as well. We stopped on the way to the Opera and were out in plenty of time to get to the performance. Quick dinner before theater near by. Food was great, place was loud. The noise bothered me more than my husband. Fun place to go! Great bar, food was excellent and drinks were well done. We will definitely be going back. Love Lavergne’s so much! Don’t change a thing! Actually, maybe have a few more wine selections. I invited a friend to your establishment Friday and she doesn’t like the single Chardonnay selection on the menu. As many times as I’ve patronized your tavern I didn’t realize how small the wine list is. I know the focus is beer but some of us women only drink wine. Other than that, you guys are awesome! We frequent Lavergnes very often. Great food and great service, always! Usually don't make a reservation but it was trivia and 3.12 night. Everyone is our group had a great time and the food was excellent, as always. Appetizers: Grilled Brie, Italian Beef Eggrolls, Buffalo Cheese Curds. Entrees: Steak Sandwich, Cheeseburger, Pasta, Sliders. Enjoyed the 312 specials including the rhubarb, which I would definitely order again. Consistently great food and atmosphere! Despite having to wait almost 1 hour after our reservation time to be seated, the food was awesome! There was a fundraiser going on that night, so we couldn't sit at the high table we reserved, and it was so loud we could barely hear each other. We did get some free appetizers and our server was super. I would go back, but I would actually call ahead of time to confirm the reservation. Always love their food, but the Valentines special prime rib was to die for! I ALWAYS love going here. They treat you so kindly even the kiddos get treated well. I'm never disappointed with the choices of both food & drinks. Usually my Mom & I get a few small plates to share. This time we got 2 appetizers (Grilled Brie plate & Wisconsin Cheese Curds) & an order of the Chicken Tinga tacos. We were stuffed by the time we finished. My son LOVES their burgers & fries. Will definitely be back soon!!!!! My son-in-law is Vegan and in town for the holidays. I like to find places to go with a few choices for him so we went to Lavergne’s the last time he was in town and when they came back he wanted to go back. I always find something different to try and it’s always been delicious. Was in recently for brunch and the vegan tofu/veggie skillet was excellent. This was not my first visit - every other experience has been just as good. Great place to have in the neighborhood. This is a regular spot for my family. The staff is friendly and accommodating, the food is delicious with a menu that changes with the season, as well as weekly food specials. The craft cocktails are some of the best and beer is always cold! This place never disappoints! Our first time dining here and we loved the look & feel of the interior, but were a little surprised by the choice of music - all EDM. And with so many TVs mounted but only one with a game on, it was a little odd. That being said, the food, drink menu, and friendly, attentive service will be bringing us back in the future. The food is outstanding and the prices are too! With a Bloody Mary bar and fried chicken and waffles, I was in brunch heaven! The food is alway great - not your typical bar food. Nice variety of meat, fish, vegan, too. Great beer selection. Close to home and not too pricey. We sat inside, in the room next to the bar area. It was loud. We had the egg rolls, ordered them twice. Genius combo. Mini sliders, Brie, shrimp street tacos and asparagus. As always LOVE it here. I will continue to go back. Never had an issue with anything whether it be food or our drinks. Thank you for continuing to be a reliable place to go !!!!!!!! Great staff and great food. 100% kid/family friendly. Typical sports bar - loud music, too loud to have a normal conversation. Food was typical as well. Had the turkey melt - was disappointed since it wasn't carved turkey buy only deli meat. The taste was good but expected better quality for the price that was paid. The beef egg rolls, on the other hand, were delicious and unique! Very good! Service was good. Food was average at best. So I'm biased to this place because it was the former bar I spent many nights hanging out at in my 20's-30's. I love how they revamped it. I love the menu. The kids menu is great with amazing sized portions. I just keep going back. It also helps that the WHOLE staff from FOH to BOH is amazing. Being someone who's from the industry (starting as a chef & working my way into management) it's rare to see anyone that's patient with a 3yr old & as well as attentive but they all are. He's even been taken on a tour by the manager. Matthew's special needs so I've been staying home with him & even though his speech isn't perfect he likes to order his food. The crew here takes their time & always understand him. This makes him SO happy when they reiterate his order & ask him if he is enjoying his food. They NEVER ignore him they ALWAYS include him. This is WHY I continue to go back. Also my niece Courtney works her so I try to get in her section when I can. She's a great girl & I've seen how she treats her other tables just like us....as if they were family. I'll definitely be back soon!!!!! Please do NOT change anything!!!!!!! Went there for brunch and we absolutely loved the food. I look forward to going again for their weekly specials. This has to be one of Berwyn’s hidden treasures. Lavergne’s is a super cute place. Excellent variety of food and drinks. We had the beef egg rolls and they were yummy. All of our meals were delicious. I would highly recommend anyone to stop in. We will be back!!!! Love the Italian beef egg rolls!! I love eating at this restaurant. It’s a great neighborhood place to go for several occasions. We love going for drinks and appetizers at the bar, dinner, and now we go for brunch often. However at this last visit I did have one tiny complaint. In front of the building, there was all kinds of garbage. There were empty cigarette packs, beer bottles, empty water bottles, and other junk. It looked terrible. I’m guessing it was from the night before, but it would be in the establishments best interest to send someone outside to tidy up before they open. It did not deter me because I had been there before several times, but to a new customer that may be a big turn off. My first trip to Lavergne's Tavern was a great one. The service was fantastic as was the food. We came in for brunch and loved everything we ordered. The Bloody Mary bar was a nice touch as well; they offered lots of toppings for you to customize. The outdoor seating seemed nice too. Perfect spot to grab a beer on a nice day. Highly recommended. Finally got to try Lavergne's! Really good burgers - perfectly cooked, great ingredients. I had the "Butter" burger with Havarti cheese and carmelized onion jam - so good! More than enough fresh-cut fries. Had O-rings as the appetizer - crispy & delicious. Great selection of beer. Would definitely recommend this to friends. Tasty brunch! Upscale dining on a budget. Fresh and flavorful. $5 Bloody Mary bar was awesome deal. This was our third time eating here. The impossible burger is the best in the Chicagoland area! (We order it with real cheddar cheese and real mayo). We also tried food off the brunch menu that were all fabulous! Corncakes without chorizo, avocado toast, and french toast.. yummy! Try the key lime pie for dessert! Make a reservation. Food at Lavergne's is always excellent, and staff is always very friendly. Waitress this time was not completely on top of her job, but so nice that it hardly mattered. Only downside to Lavergne's is that it gets very noisy on the weekends, hard to converse with someone who's not sitting right next to or across from you. I absolutely LOVE this place!!!!! There's something for EVERYONE. I usually do Gluten Free, Dairy Free, even Vegan if possible (due to health issues). I broke that pretty much on this trip but that was by my choice. I could've EASILY found various dishes that fit within my dietary restrictions. Otherwise the kids menu was awesome but the portion size was AMAZING!!!!!! We had a wonderful server (totally adorable guy kind of quiet) & Courtney is another great server as well!!!! You can't go wrong with the staff (the manager took my son on a tour/I'm a former chef who stays home with him now because he's special needs). Family friendly great food that doesn't break the budget. SO glad something this good took over my old hot spot (Garv's)!!!!!! Solid food. Solid drinks. Friendly service.